AFP: Singapore yesterday rejected President Maithripala Sirisena’s allegation that it was sheltering a former Central Bank chief wanted for fraud, saying Colombo failed to provide documents to support its extradition request. Sirisena on Monday accused Singapore of sheltering Arjuna Mahendran, one of his country’s former Central Bank chiefs wanted in connection with a high-profile $ 74 million insider trading scam. 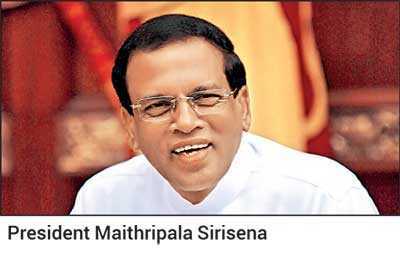 Sirisena said he appealed to Singapore Prime Minister Lee Hsien Loong in January to return Mahendran, who is believed to be in Singapore, but claimed nothing had been done. Mahendran, a Singapore national of Sri Lankan origin, was accused in 2015 of passing sensitive information to his bond-dealer son-in-law to make millions. The pair are accused of manipulating bond auctions in 2015 and 2016, causing losses of over $ 11 million to the State. In February last year, Mahendran was named a key suspect in the multimillion dollar bond scam in Sri Lanka. He fled abroad, failing to appear in court to respond to charges. Sri Lanka Central Bank also launched a forensic audit to ascertain the extent of insider trading during Mahendran’s tenure at the Bank.